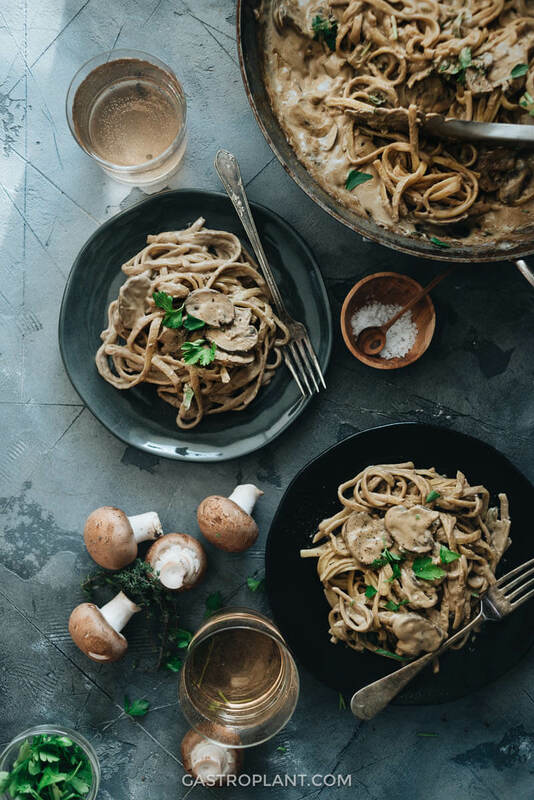 This Creamy Vegan Mushroom Pasta features a sauce that is intensely creamy with a full-bodied mushroom flavor. 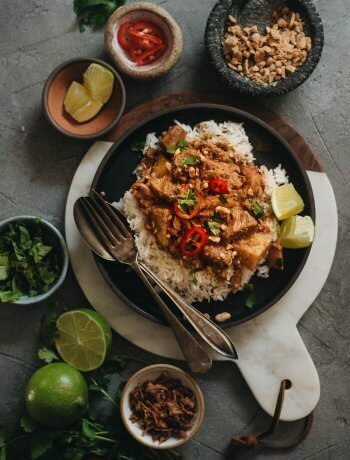 The recipe uses cashews, almond milk, and dried mushrooms to create a very satisfying plant-based sauce. 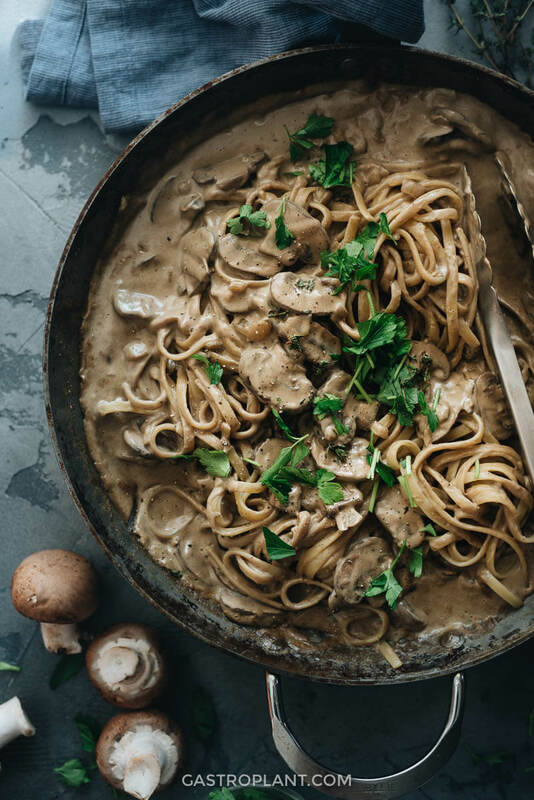 I was introduced to cashew cream in a pasta sauce by The Happy Pear, in their creamy mushroom pasta recipe. 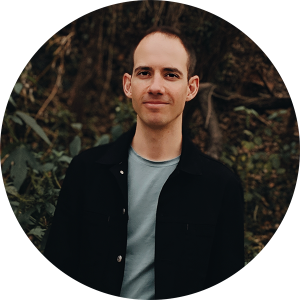 They run a very impressive venture that promotes nourishing plant-based eating in a number of different ways, including recipes. And the “pear” themselves (identical twins Dave and Steve) are very entertaining and exude lots of positive energy. I highly recommend checking them out. Over the past several months I’ve been cooking their mushroom pasta, experimenting and tweaking each time. The original recipe is very simple and straightforward and also oil-free. If those aspects interest you, please do consider their recipe. I eventually made several enhancements to it in order to get a richer and more full-flavored sauce. I generally enjoyed the sauce in the original recipe but felt that it could be made richer with not too much more effort. Since the two major things I added, dried mushrooms and nutritional yeast, end up going in the blender, it isn’t much more work to add them. And they make a tremendous difference in the flavor of the sauce. Other tweaks I made include swapping the lemon juice for vinegar and adding sherry. You can use either lemon juice or vinegar, but it’s important that you have one of those. The benefit you get from the acidity of either ingredient cannot be understated. Sherry can make any cream sauce pop. Just a splash adds another layer of flavor that is perfect with the mushrooms. The cashew cream at the heart of this sauce impressed me so much that I started to experiment with it in other contexts. I developed a creamy tonkotsu ramen broth and enchilada filling with it. I’m planning to make more pasta sauces, definitely a cream of mushroom soup, and maybe even desserts with it. It is very versatile and you can expect to see it in many more recipes to come. Let me know if you have any suggestions in the comments! This one is pretty straightforward. Boil the pasta in salted water, drain it, and set it aside. Saute onion, garlic, and mushrooms in olive oil. Blend several ingredients to make a cashew cream. Mix the cashew cream in with the sauteed mushrooms. Stir in the pasta. Eat. The recipe requires a high-speed blender for the cashew cream. In the recipe, a half-pound of pasta is called for, but the amount of sauce is enough for up to a whole pound of pasta. 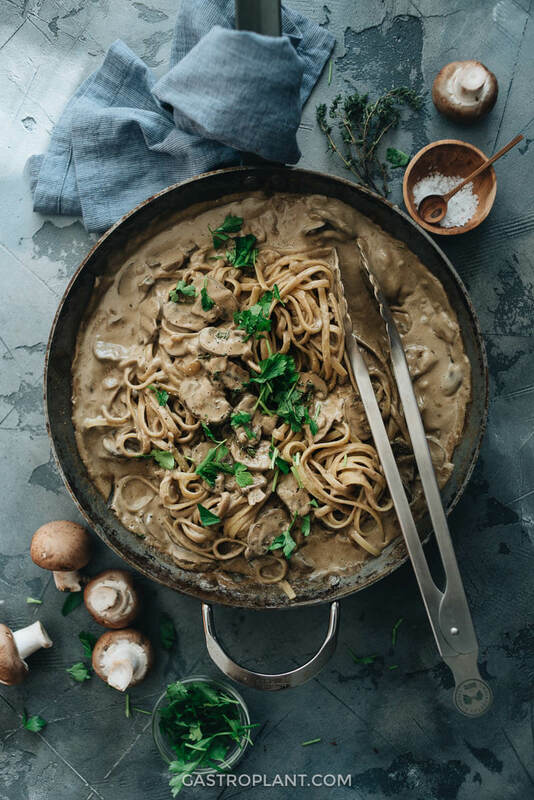 You can do some of the cooking activities simultaneously – boil the pasta while sauteing the mushrooms, or blending the cream while doing either of those. But be mindful of cooking times if you do. Combine all the ingredients for the cashew cream in a high-speed blender. Blend on low for 20 seconds, then on high for 40 seconds, until it forms a smooth creamy liquid. When the oil is hot, add the onion and garlic. Stir until just transparent, about 2 minutes. Add the mushrooms. Stir and cook until the mushrooms are just cooked through, about 5 minutes. If the mushrooms stick to the pan at any time you can add the tablespoon of sherry, vegetable stock, or water and scrape the mushrooms free. Stir in the soy sauce and blended cashew cream. Reduce the heat to medium-low. Bring to a simmer and taste the sauce. Add salt as needed. Stir in some the mushroom soaking water or pasta boiling water if you need to thin out the sauce. Add pasta into the skillet with the sauce. Use tongs or chopsticks to stir the pasta and coat it thoroughly with sauce. Simmer until the pasta is heated through. Garnish with parsley, thyme, and black pepper and serve immediately. This recipe produces a generous amount of sauce for half a pound of pasta. You can use the same amount of sauce for a whole pound of pasta, though you’ll need to thin the sauce out a little bit and add extra salt, garlic, and vinegar to taste. The dried mushroom blend that I use contains oyster, portobello, black trumpet, and porcini mushrooms. You can use any one or combination of those. Dried white/button/champignon mushrooms works nicely, as well. I use dried mushrooms here because of their potent flavor. If you have a very high-speed blender (e.g. Vitamix) you can get by without soaking the cashews. Almond milk is my usual plant milk. For fresh mushrooms, I use brown/cremini. Portobello, white, porcini, oyster, and king oyster will work well here. 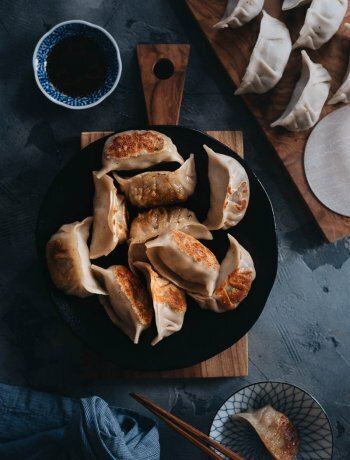 I’ve just discovered your site and can’t wait to try your recipes — starting with this one! Two quick questions: what kind of vinegar and doesn’t not soaking the cashews before blending make the resulting cream a little gritty? This is the first recipe using blended cashews that I haven’t seen them soaked. I’m open-minded and willing to skip it if it works! Thank you so much! Hi, Heather. Thanks for your message! I’ve used both balsamic and apple cider vinegar to make this and both were good. I think it’s good to have some sweetness and fruitiness to it. And when it comes to soaking, I’ve been trying the non-soak method to see how much simpler I can make the recipe, and this has worked well with my blender (the sauce hasn’t been grainy) but that may not be the case with every blender. If you have time to soak the cashews, it will certainly make for a smoother sauce in any case. Rather than ask you to be a guinea pig on this, I recommend soaking if you can. I’ll add a note mentioning it. Enjoyed the recipe. 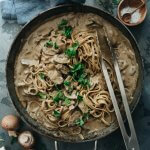 I’ve been looking for a vegan beef stroganoff-type dish, rich with a lot of meatiness. The cream sauce was great for that. 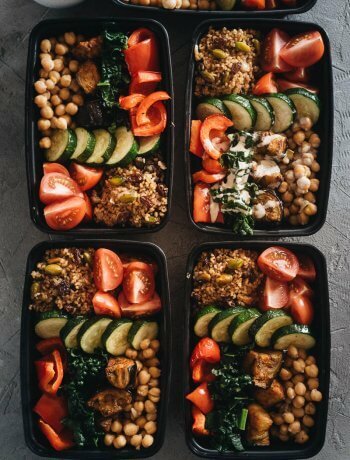 We added cubes of tempeh–it was nice to have the bites, but the flavor of the tempeh was a bit off. I think next time we will add a little more vinegar, soy sauce, mushrooms, and thyme. Looking forward to your next recipes and to trying what else is on here. Thanks for the feedback, John. I’ve been working with tempeh as well, to figure out how to get great flavor from it. Some successful (but not yet worthy of recipes) experiments included slicing it, marinating for 10 minutes or so in a combination of soy sauce, maple syrup, and sriracha, then microwaving it (lazy, I admit, but the flavor is good). I think you can’t go wrong by adding more of any of those ingredients you suggested. Sherry is also definitely worth trying if you’ve got some handy. Let me know how it goes, in any case, and if there’s anything else I can help with. Any reason not to just use cashew butter? If not, how much would you estimate one should use? That’s a good idea! Since cashew butter is much denser than whole cashews, I’d recommend using half a cup (plus a tablespoon) of cashew butter. Also, if the cashew butter contains any salt or sugar, you may want to add less salt or compensate for the sugar with acid (lemon juice or vinegar) as the case may be. I hope that helps!